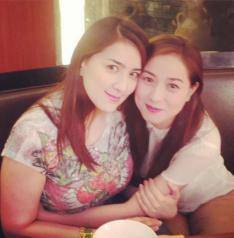 ABS-CBNNews.com reports that "in her official Instagram account on Monday, April 1, Cristine Reyes posted a photo of her hugging sister Ara Mina with the caption, ’With the gift of listening comes the gift of healing.’"
The report pointed out: "It would be recalled that Cristine allegedly asked Ara to turn over an SUV as payment for the remaining P1.8-million balance for a Quezon City townhouse they bought in 2011 for their mother. If not, Reyes allegedly threatened that she would continue her personal attacks against Ara. Then in April last year, Ara filed charges of libel and grave coercion against her younger sister not to claim money but to ’teach her a lesson’ for her attitude. Ara had said through her counter-affidavit that she would retract the case if Cristine issued a public apology. Cristine did so, but Ara found her apology insincere." Well, this smackdown seems to have ended well.